A huge wildfire has continued to push toward a string of California coastal cities fuelled by gusty winds that have blown across the state for nearly a week. Another 56,000 acres / 225 square km were destroyed on Sunday making it the fifth largest blaze recorded in state history since 1932. The combination of Santa Ana winds and rugged terrain in the mountains that run through Santa Barbara and Ventura counties hampered firefighting efforts and officials said the Thomas Fire was only 10 percent contained on Sunday evening, down from 15 percent earlier in the day. But wind gusts recorded at 35-40 miles per hour were less fierce those predicted by forecasters, giving crews a chance to slow the flames' progress down slopes above the endangered communities of Montecito and Carpinteria. "This is a menacing fire, certainly, but we have a lot of people working very diligently to bring it under control," Santa Barbara County Sheriff Bill Brown told reporters. 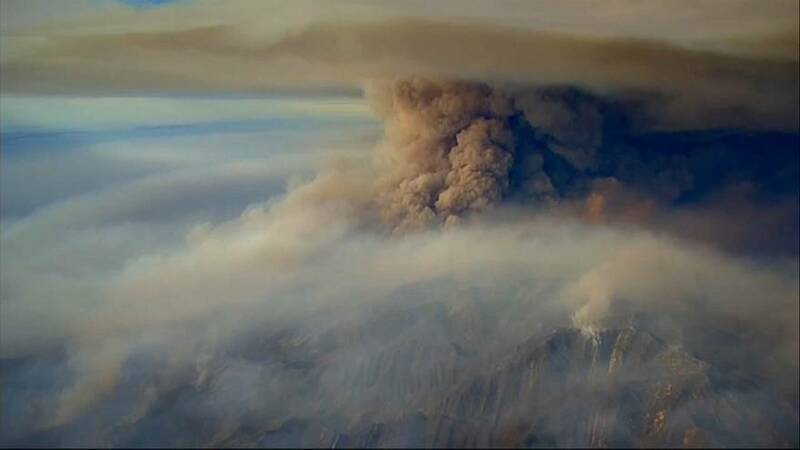 Still, some 5,000 residents have been evacuated in the two communities, near Santa Barbara and about 100 miles (160 km) northwest of Los Angeles, with around 15,000 homes considered under threat. The Thomas Fire, the worst of six major blazes in Southern California in the last week has blackened 230,000 acres / 930 square km, an area larger than New York City. It has destroyed around 800 houses, outbuildings and other structures and left 90,000 homes and businesses without power. The fires burning across Southern California have forced the evacuation of more 200,000 people and destroyed around 1,000 buildings. Among them are residents of Montecito, one of the state's wealthiest enclave and home to such celebrities as Oprah Winfrey.